Hippopotamuslee: Kitty Faces on EVERYTHING! 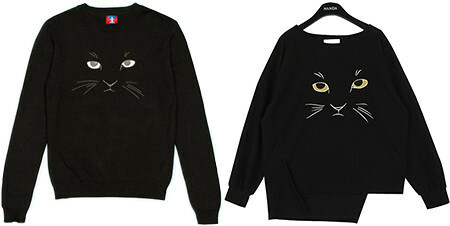 After a few "cat+face+sweater" google searches, Opening Ceremony seemingly made the adorable sweater they're wearing, but only carried it in men's for a whopping $150. Turns out I was wrong, though. They're actually wearing a Korean knock-off by Style Nanda ($43.93)! Opening Ceremony on the left, Style Nanda on the right. Completely unwilling to pay more than $20 for a cat face on a sweater, I decided I'll do it myself. I don't know which cat face I should try, but I've purchased new floss and two sweatshirts that are in the wash as I type this. So excited for the 9-year-old Cats (the musical) fan in me who definitely owned this shirt.